Following up on my article on the plight of laid-off Cort guitar factory workers, it looks like some prominent guitar folk are getting involved. Rage Against The Machine guitarist Tom Morello showed his support at a recent Cort Action Solidarity concert on January 13. 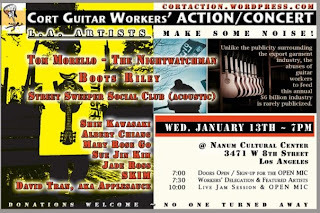 The concert, dubbed A Night of Guitars, was staged during NAMM 2010 week in Los Angeles while guitar manufacturing bigwigs were in town. 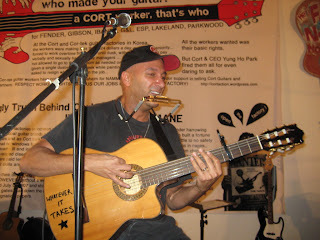 In addition to their own guitar line, Cort also supplies Fender, Ibanez, Gibson, Lakland and ESP. Fender apparently, is the first to step up to the plate and will be conducting their own investigations into the Cort guitar factory lay-offs.